Two years ago, I was stuck home on my second day of maternity leave. I'd gotten it into my head that if I worked up until 38 weeks, I'd give birth a day or two later and all would be well with the world. I was so rotund on my last day that my work colleagues were convinced that I would end up giving birth whilst stuck in the rush hour traffic on the A38 and naming the baby Filton. Little did I know that it would actually take a further four weeks for her to put in an appearance. Four very loooooong weeks. I hate cleaning with a passion. The husband spent most of my pregnancy not praying for the safe arrival of our unborn child, but that the nesting instinct would kick in. The closest I got to nesting was watching back to back episodes of Location, Location, Location followed by A Place In The Sun and Come Dine With Me. Interspersed with other foodie programmes. I don't normally get to choose what's on the telly so this was my bit of self indulgence. Amongst all this goggleboxing, I watched some programme or another where Aldo Zilli made Pancake Tagliolini. I duly Googled the recipe and saved it to my favourites but I never got around to making it - until today. In essence, it's just strips of pancake in orange sauce with some warm berry coulis and ice cream on the side. It's very tasty. But it's not really pancake day fayre - it's too poncey. Pancake day is all about pancakes with lashings of lemon and sugar. And nothing else. 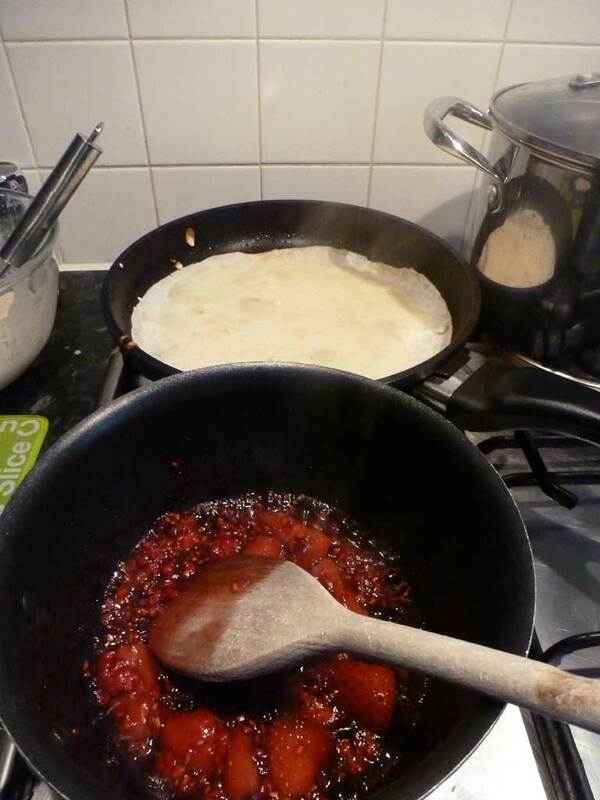 Call me a 'Creature of Habit' or 'Old Skool' but pancake day is about proper pancakes. And if I want something poncey, I'll go with Crepes au citron et sucre thank you very much. My favourite foodie destination (so far) is France because they cook perfect steaks, sell proper patisserie in service stations and make amazing pancakes. As a child, I spent many summers in Brittany, home of the galette. I haven't made them for a while, but we would regularly have galettes for dinner - stuffed with jambon, fromage, oeufs and champingnons. Anywhere else in France, savoury pancakes are just regular pancakes with a savoury filling, but in Brittany, they are made from buckwheat flour which lends a beautiful, crisp, nutty flavour to the pancakes. Sublime. And if you're ever in London Town, and you love pancakes as much as I do, you should go to My Old Dutch in Holborn - a favourite haunt of mine from my days working in the Big Smoke. Here, you can get both sweet and savoury pancakes. But not just any savoury pancakes. How about Chicken Curry in your pancake? Or Lamb Stew? Or Marinated Artichokes, Sundried Tomatoes and Mozarella? And their thirteen inch pudding pancakes served on beautiful Delft pottery plates are worth every calorie - and then some. Anyhow, returning back to the pancake dish in hand, my only criticism of it was that the pancake batter was a little rubbery. I guess this is so that it holds itself once cut into strips and then tossed about in the orange sauce. It definitely wasn't a great pancake mix to eat as just pancakes. I'm still on the search for the perfect pancake batter recipe. Delia is not a contender and neither is Mr Zilli now. Ah well, the research will be pretty tasty. As I didn't have enough raspberries in, I made the coulis with a mix of strawberries and raspberries. 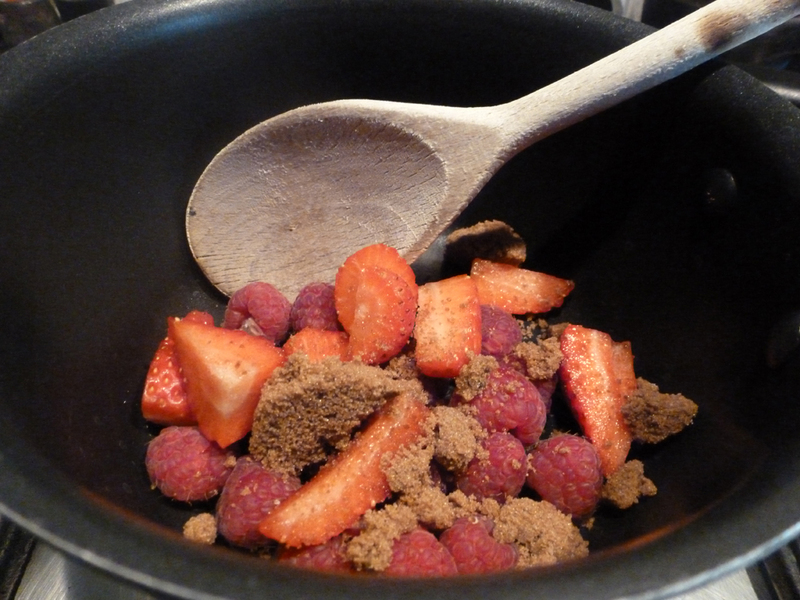 It made for an interesting 'coulis' as it was more just warm, softened berries. In my mind, a coulis is a sweetened, fruit puree but this one was warm and the seeds were left in. And as I used strawberries, they didn't break up well enough, but it was really nice to have the contrasting texture with the raspberry sauce and the strawberry chunks against the soft pancake strips. 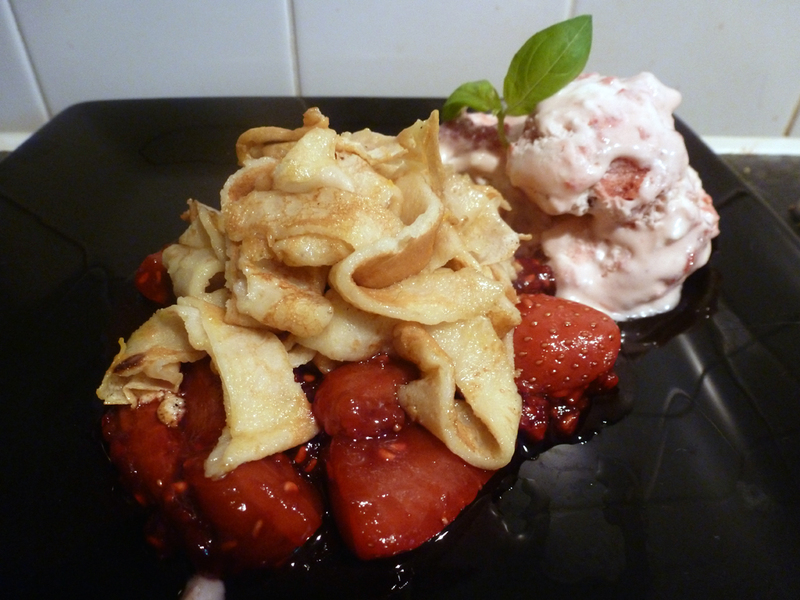 I served it all with a scoop of the strawberry meringue ice cream that I made with Miss A at the weekend. Definitely a fun dinner party dish and great because you can prepare it all up front and just heat the sauces to serve. Just on the right side of the 'I'll make it again' list. 1. First make the pancakes. Break the egg into a jug and add the milk and half a tablespoon of oil and whisk together. 2. Sift the flour into a mixing bowl and gradually beat in the egg mixture to make a smooth batter. 3. Heat a 17.5cm thick-based frying pan and wipe some of the oil all over the pan. Pour a quarter of the batter into the pan, swirling around to spread the batter. Cook for 1-2 minutes until the batter is set and golden on the base. 4. Flip over and cook for a further 1-2 minutes. Place the pancake on a sheet of greaseproof paper. Repeat the process to make a further 3 pancakes. Thinly slice the pancakes in strips. 5. For the coulis, place the raspberries in a saucepan with the brown sugar and simmer for 5 minutes until the raspberries break up to make a sauce. Set aside to cool. 6. Meanwhile, place the caster sugar, butter and orange juice in a frying pan and heat gently until the sugar to dissolves then bring to the boil. Boil for 3-4 minutes until quite syrupy. 7. Add the strips of pancake and stir into the sauce; cook for 1 minute. 8. To serve, spoon the raspberry coulis onto 4 chilled serving plates and top with scoops of ice cream. Then spoon over the pancake tagliolini. Serve immediately.